Rarely have protests in China been so well organised, or the protesters so well-dressed. The residents of Pingyang district, in the south of the city, say their health is at risk and their homes will become worthless if a planned extension to Shanghai's futuristic maglev railway goes ahead. They are part of China's new middle class. Many of them bought their first homes here, capitalising on China's new economic freedoms. The government is considering a 30km (19-mile) extension to its showpiece magnetic levitation train. The train, which floats on magnets, is the fastest commercial train service in the world, travelling at 430km/h (267mph). But local residents along the route - including those in Pingyang - say the electro-magnetic field is dangerous and that their homes are now impossible to sell. "Real estate agents won't come near now; we'll lose everything if this goes ahead," said one woman who did not wish to give her name for fear of official reprisal. "We're prepared to take the risk, because our health, and a safe living environment, is more important," she said. 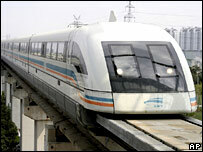 The maglev is a controversial project. The original $1.4bn (£715m) line runs from Shanghai's international airport to the outskirts of the city. Despite its incredible speed, it is poorly connected to the rest of the transport network and it is often quicker to travel by taxi than use the maglev. Critics say the project is a white elephant and the government would be better spending its money on improving the city's ageing fleet of buses. China is a country with little patience for dissent. But in a little over a week, Pingyang residents and their neighbours have marched through the city, chanting and waving slogans. At the weekend many hundreds of them took their complaints to Shanghai's city hall - the seat of communist power. The largely middle class protesters are keen to downplay any political aspect of their defiance. They insist on calling their well-organised marches "going for a walk" events. Protests in China usually come from the landless and the poor. It is rare for China's newly rich middle class to take to the streets. Many have struck a bargain: in exchange for their new wealth, they stay out of politics. Largely ignored by official state media, the protesters are using their sophisticated organisational skills to grab what attention they can. Within minutes of our arrival in the neighbourhood, a couple of hundred people had gathered, marshalled by text message and email. And although the "walks" are centred on a single issue, they are unmistakable acts of defiance. On Saturday, dozens of demonstrators were detained by police. The next day others were dragged and shoved when they took their protest to a busy shopping street. Residents in the areas affected by the planned extension complain that local officials and police are trying to intimidate them, and that the government has set up video cameras to monitor activities in their neighbourhood. 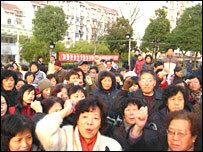 The protests are the biggest Shanghai has seen since the anti-Japanese protests of 2005. Then, thousands of people, many of them students, demonstrated against Japan's perceived failure to apologise for its war record. 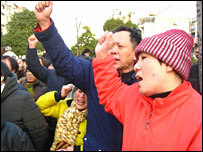 However, those demonstrations, unlike the maglev protests, had tacit government approval. Around the Pingyang neighbourhood, police had come and removed their anti-maglev banners, replacing them with official-looking slogans that instructed them to make their protests "through proper channels". But China is a country where laws are still being written and where there are few checks and balances against the authoritarian rule of the Communist Party. People have gained greater economic freedom under the government's opening up process, but they don't have the political and legal rights to match. "The email address they have given us isn't even a government address, it's a private email. So how can we go through official channels? There is no proper process," explained one man. Others complained that the consultation period for the train line had been too short or lacked transparency. The government says it will meet representatives from the neighbourhoods and that a final decision has yet to be taken on the project. As well as the e-mail address, it has also set up a hotline to listen to people's complaints. The Shanghai protesters have taken comfort from other public protests in China. Last June, protests in Xiamen, Fujian province, are believed to have led the local government to drop plans to build a chemical plant, because of health risks. The Xiamen decision has been hailed as a victory for people power in China and has featured widely in state media. The local residents in Pingyang are putting their faith in this new "listening communism" - one that promises to be more responsive and less corrupt by paying attention to people's complaints. "We love our government, we just want them to listen, and we'll keep marching until they do," a local resident said.